The Department of Education and the Northern Ireland Commissioner for Children and Young People (NICCY) are observers of the Forum. 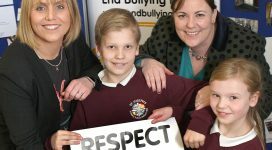 Membership of the Northern Ireland Anti-Bullying Forum is open to regional organisations whose work relates to children and young people and who have a particular interest or expertise in bullying. Applications for membership should be made, in writing on headed notepaper, to the Chair through the secretariat. Applications should confirm organisation, position of nominated person, agreement and commitment to NIABF’s Strategic Outcomes. Membership applications are only considered at the next available NIABF quarterly meeting. NIABF is currently hosted by the National Children’s Bureau (NCB) NI, represented by Celine McStravick.